How many of you have the optional MK63 4piston calipers on the front of your Skyline? While you may be running 15" or larger diameter wheels, have you tried fitting 14" steelies over these calipers? Did your car come with a 14" steel spare in the trunk? was that a gtr option?? So not a factory installed option, but instead a factory available racing option. Do you have them on your car? I have vented type MK63s on the front of my KPGC10, and I think you might find that a slim spacer is needed if you want to bolt a stock steel wheel over them. Most alloy wheels - even 14" diameter - will fit over them. They have to be wheels with a really thick rim, or a very weird offset, to foul the calipers. 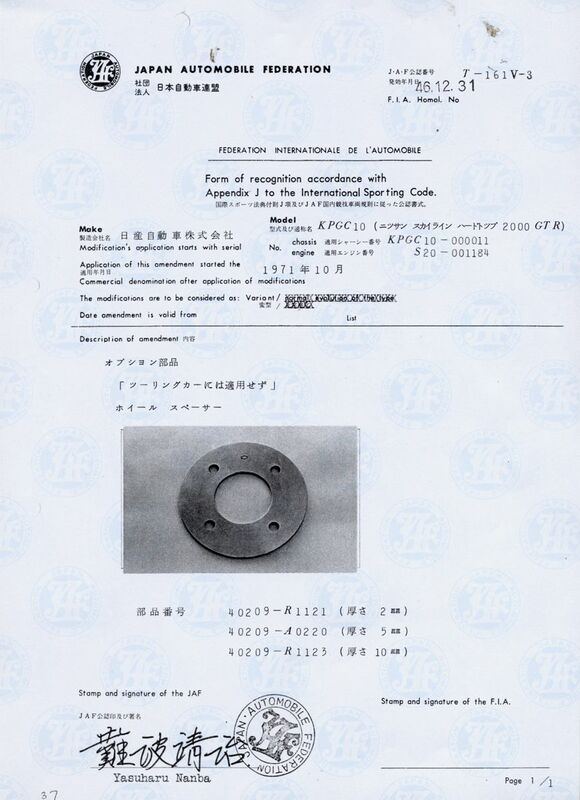 Nissan made a special alloy shim spacer for just this purpose, and listed it in the Sports Options parts lists for the PGC10 and KPGC10. Part number was SPACER WHEEL 40209-A0220. It was just a very simple shim spacer, about 3mm thick, that slipped over the wheel studs on the hub and was sandwiched between the wheel and the hub. The kind of thing you can still pick up from a wheel specialist today. Jogged my own memory, and dug out the JAF/FIA homologation papers for the KPGC10. Nissan went to the trouble of homologating the spacers for race use. There were actually three thicknesses available: 2mm, 5mm & 10mm. As you might be able to see from the photo on the homologation papers, they even went to the trouble of stamping the Nissan 'hamburger' into each piece to denote authenticity. Centre bore was 77mm to clear the hub. Are you going to be using stock steel wheels on the car ( occasionally? ), or is this more about carrying a spare wheel that will fit over the calipers? no I have my great aunts auto 240k so no standard goodies. But I was wondering if it's an acceptable practice to put a spacer between the 2 half's of the standard 2 pot callipers (I'm assuming they are 2 piece) to fit them over vented disks? But I was wondering if it's an acceptable practice to put a spacer between the 2 half's of the standard 2 pot callipers (I'm assuming they are 2 piece) to fit them over vented disks? that was the "sports option" for 1200(sunny)b110's in japan(and america?). This is just for spare tire purposes only. My C10 currently does not have a spare and with the 700mile drive I need to do with the car in a couple weeks I don't want to run the risk of getting a flat in the middle of the desert. I'll order one up today. It might be a good idea to take a couple or three shims of different thicknesses to 'stack' as necessary. There might be some variation on steel wheel clearance, depending on what wheel you take. Don't forget to take some stock - open-ended - M12 x 1.25 wheel nuts too. The closed end ( Watanabe? ) wheel nuts might not work with a steel wheel. Good luck with the journey home! I had the opportunity to try out a stock 89-94 240SX 15x6 steel rim over the MK63 calipers. It cleared the caliper but required a 5mm wheel spacer not to rub due to the 240SX' different offset. Maybe this is useful info for someone else?